The US charged into a 3-1 lead after dominating the opening session of fourballs at Le Golf National near Paris. But it wasn’t all good news for the visitors after it emerged Tiger Woods has picked up a back problem and has been left out of the afternoon schedule. There is a suggestion Woods, who has undergone four back surgeries to save his glittering career, will miss the morning session of tomorrow’s second day in favour of undergoing intensive treatment. But Harmon insists the 42-year-old is merely ‘stiff’ – and that he’s not crocked seriously. “He did not play well from the start. 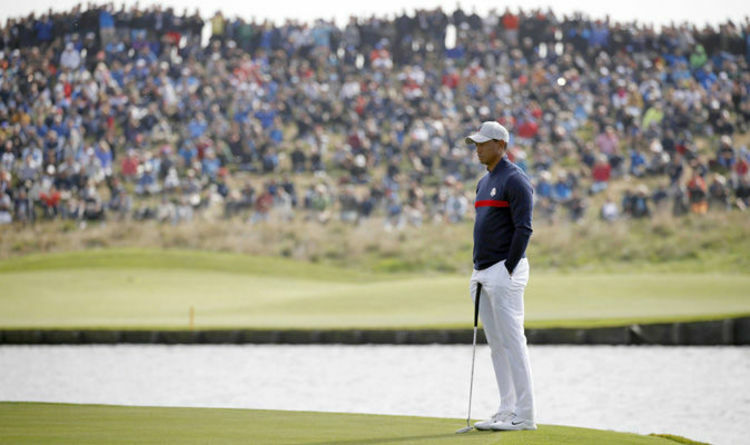 He didn’t start well from the first tee,” Harmon said of Tiger Woods on Sky Sports. “He didn’t have all the stuff that we’ve seen from the last month or so. Whether his back is bothering him or not, I don’t think he’s hurt, I think he maybe stiff. “I think sitting out this afternoon was always going to be a plan for captain Furyk. Thomas Bjorn’s decision to field four rookies blew up in his face as Team USA took control of the Ryder Cup. Dustin Johnson and Rickie Fowler dispatched Rory McIlroy and Thorbjorn Olesen 4UP to post the first point for Jim Furyk’s men. McIlroy was poor from start to finish and the only player out on the course not to register a single birdie. Jordan Spieth and Justin Thomas beat Paul Casey and Tyrrell Hatton 1UP after leading their match from start to finish. But the killer blow for Europe came in the top match between Justin Rose and Jon Rahm and Brooks Koepka and Tony Finau. The European pair led the game from the start but missed a host of chances to seize control on the back nine, allowing their US rivals to cling on before snatching the match with a par on the final hole.